He arrived at the Starting Area two hours before the Gun Start. I personally don’t know the man but looking at his physique, I already knew that he is an elite runner. I just observed him walking around and within the Assembly Area of the Race inside the Rosario Municipal Plaza (Rosario, La Union) and I was trying to figure out his running kit. He was wearing the usual running shorts with an upper garment which seems to be a midrib attire usually worn by elite lady runners as well as the men’s elite. He was wearing those colourful ladies’ hose/socks whose length is up above the knees and the color on one leg is black and the other one leg is a combination of light green, pink and cream. The socks must be functional for him as a combination of the usual socks and calves sleeves! He was wearing an old shoe which I suspected to be a worn-out racer flats. He seems to have a problematic face and trying to look a familiar face within the crowd. After few minutes, he figured out whom to approach and asked about the race. He came to me and asked me if he can join the race. I said, yes! I pointed where my staff was located to show him where he should register and get his race kit. But his facial expression showed some problem. He was telling me that he was to be sponsored by another runner and he was waiting for the said runner to arrive for him to pay the registration fee. He told me that he “hitched a ride” in one of the vegetable cargo trucks from Baguio City to reach Rosario, La Union and be able to join the race. He pleaded to me that he is interested to join the race as he knows the route and he would like to test his running capability for an ultra distance. He was showing me some folded bills of money (Fifty Peso bills) which he said is not enough for the registration fee. (I found out later that he has only 450+ pesos tucked in his running shorts) He told me that this is the first time for him to run an ultra distance of that long. Bernadette Schleuter from Guam, USA came to me and asked if I will allow her to sponsor Marcelo to join the race. I was surprised and little embarrassed to find out that Marcelo approached the lady runner to support him in the said race. I said “yes” to Bernadette. Bernadette gave him P 1,000 and I accepted the money as his registration fee (50% discount rate). I told him to keep his own money for any contingencies during the race and for his fare in going back to Baguio City. I allowed him to run without any lights and reflective vest. I told him to be very careful of the incoming traffic and warn him about the dangers of falling rocks and constructions being done along Kennon Road. He gave me the assurance that he will run responsibly and carefully during night time and take extra careful along Kennon Run. He assured me that he is very familiar with Kennon Road. I was touched when almost all the runners from Baguio City offered him Gels, fruits, power bars and other bite foods before the start of the race. He was not wearing any hydration pack or “fuel” belt! He just simply tucked the gels, bars, and fruits on his running shorts and started eating and drinking some water few minutes before the start of the race. Once the gun was fired, he positioned himself at the front and he maintained his position throughout the race. He reached the Checkpoint at the View Deck of Kennon Road in 5:15+ hours! The next runner to reach the Checkpoint was more than two hours behind him. As he predicted to finish the race in 7 hours, he crossed the finish line in 7:56:50 hours! My staff offered him some drinks and food after he crossed the Finish Line! I congratulated him for setting a Course Record for the route and told him to rest/sleep until the rest of the runners would arrive at the Finish Line. After eating, I asked one of the staff of the Mayor to bring him to the house where he left his things which is one kilometer from the Finish Line by riding tandem on a motorcycle but he refused the offer. Instead, he jogged to the house and returned to the Assembly/Finish Area after 40 minutes. He slept and later waited for the rest of the runners to arrive. After breakfast the day after, I had the chance to talk to him together with the Municipal Mayor of Rosario. I found out that he is thirty-two (32) years old, married and residing in Baguio City without any children. He works as a “segregator” with the Waste Management of Baguio City with a monthly take home pay of P 2,500.00. He is known by the Mayor of Rosario to be a consistent winner in their annual 5K Run where the latest run/race was during the birthday of the Mayor last April. He was awarded some Cash Prize for winning the event. He is also a consistent Podium Finisher in running events in Baguio City. At present, he is among the top 5 runners of Baguio City. 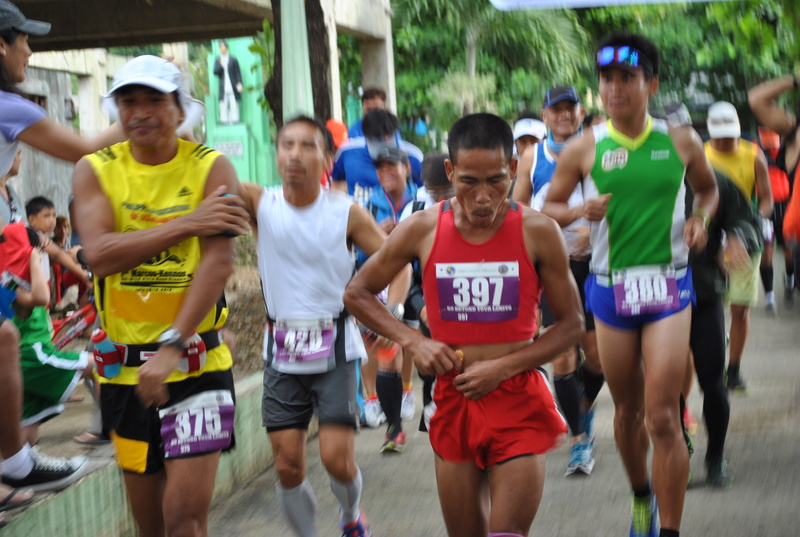 He won the latest Race to Mt Cabuyao from Burnham Park. Among his prizes was a new running shoes which he sold to a cheaper price due to lack of money to support his training. When I asked about his hydration and nutrition, he told me that he only drinks when he is thirsty and eat when he is hungry during races. On a regular day, he drinks hot coffee in the morning after his early morning run and that’s it! No breakfast, lunch and snacks! He eats once a day for his dinner after having his running workout in the afternoon. He explained that he eats a lot of rice with only one viand for the dinner, his only decent meal for the day. He works as a waste segregator from 7:00 AM up to 3:00 PM and he has time for his early morning jog and late afternoon running workout. He sleeps early in the evening after taking his dinner. He has no vices and he intimated to me that he had no running-related injuries so far! He said that he can still run a sub-38 minutes 10K race with the proper training and preparation. He was challenged by the Municipal Mayor to run a Full Marathon with a finish time of 2:45 to 2:55 hours in this coming MILO Manila Marathon Elimination Race by the end of this month. 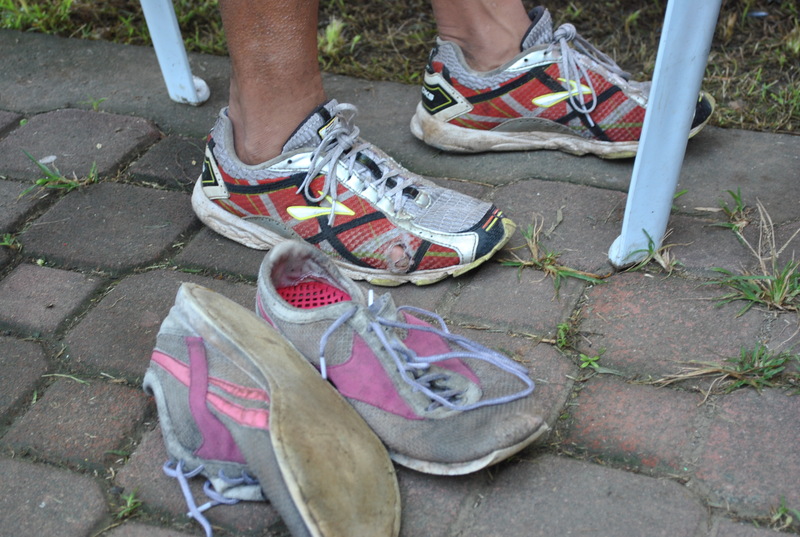 The Flores Family, to include Wap Forbes Flores, had promised him a new racing shoes, running apparel (shirt & shorts) and running socks for the said event. To top it all, his transportation, food and accommodation needs will be provided by the Flores Family. He promised me that he will not sell whatever running kits he will get from the Flores Family. You might ask, why I am telling this story about Marcelo. It’s because he is your typical fast and strong Pinoy runner who is unknown from those glitzy and “very promising” road races in Metro Manila. “Very promising” because there are Race Organizers who promise some cash prizes or travel abroad to compete but nothing comes out for the winner in the end. They are unknown because they are poor and could hardly afford the registration fees not unless they are sponsored by others. These “unknown” elite runners will never land on the pages of your typical runners’ or sports magazines! There are more “Marcelos” in the provinces who could be Champion in Road Races and Running Events. All we need is to bring the races in to the provinces and allow these unknown runners to join and prove their mettle even if there are no cash prizes. Ultrarunners have the heart and passion to help these runners, this trait makes us above than those runners who only care for themselves and their own personal interest! 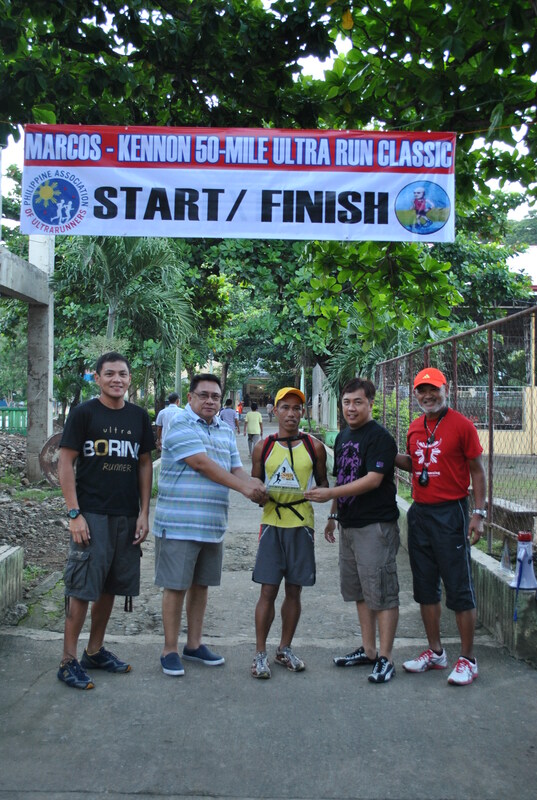 Thanks to Bernadette Schleuter and to those Ultrarunners who helped Marcelo achieved his goal as the Champion of the 1st Marcos-Kennon 50-Mile Ultra Road Classic. Please continue helping these “poor & unknown” runners! We hope to look for more “Marcelos” in the provinces throughout the country and let them join our ultrarunning events. What a touching story. I am glad that you dedicated a blog for Marcelo Bautista. Is the 81/2 US size? Got a new size 8 Asics Gel Kayano. If its a wrong size, I will get him an Asics Nimbus and bring it with me in January and give it to you. mang art, the size 8 ASICS can fit him. actually, his pink Reebok shoes could be size 7 1/2. he wanted one size bigger shoes for his downhill runs! thanks in advance. god bless! thanks for asking about marcelo in one of your comments. that gave me the idea to relate his story in this blog. sir jovie, im almost teary eyed when i finished reading this story. thinking how much people are wasting on non-essentials if running, this guy barely has anything and yet his skills and passion to run is incredible. i have an 8 1/2 mizuno here that im not using.anymore. and lots of singlets from various events. im not into collecting them actually and am willing to donate them. how can i reach you to deliver all of them? Thank you for this amazing story! He and the rest of the “Marcelos” out there are an inspiration to pursuing a passion no matter what. Unfortunately, one like him can actually bring the country a great pride if only our government is focused on supporting and developing talented and passionate people like him. He is an inspiration. How I can donate? Marcelo is such an inspiration of not giving up your dream. “…These “unknown” elite runners will never land on the pages of your typical runners’ or sports magazines!” yes sir Jovie. not in the corporate Philippine sports circle. meron silang tinatawag na ‘marketable”. di bale, we know the athletes truly worth our admiration. kapag mahirap ka magtitiis ka talaga gustuhin mo mang sumali wala ka namang pera wala ka nmang magagawa ganyan kaming mahihirap pero nagsisikap na mapanatili angt maganda naming kalusugan.pasalamat din ako sa mga kaibigang nagbibigay sa akin ng suporta para magawa ko ang aking pangarap. mabuhay ka marcelo hindi hadlang ang kahirapan para di matupad ang ating pangarap.bilib ako sayo! Thanks for this wonderful and very inspiring article. Hopefully many runners and those with the capacity to sponsor and help those very talented yet wanting in financial support will be able to read this. There are indeed lots and lots of Marcelos amidst us. This is to say that our country is resplendent of talents be it in sports, in arts, or in science. What is lacking is support that they will be able to hone their skills and not think of where to take their day’s meal. I myself know of one. He’s got the guns to be so much more than he is now given the natural talent and the burning spirit to be a competitive runner. But given his dire financial status and no nutritional and training support, he will just end up with the rest who have such promise and potential but cannot rise towards greater heights due to poverty. With less corruption and more generosity among running patrons, hopefully, they will given that which they deserve. The story of Marcelo Bautista is awe-inspiring. How Sir Jovie narrates his story is also worth a reblog. thank you very much for writing a blog like this. it inspires all kinds of athletes… thank you Marcelo for being an excellent example about following one’s dream and passion no matter what the situation is. God supports those who follow their joy and passion indeed. Marcelo, idol talaga kita. just keep on! how can i donate po sir? marcelo’s story is true.because i know him personally.we run together when i’m still in bagiuo city..thanks to all who helped him especially bernadette sluether who trusted him and gen. narcise who took the effort to tell his story to the running public.at salamat din sa pamilyang flores .god bless. It’s actually not just Marcelo, the Iloilo Running Buddies had to cheap-in and look for sponsors for Jason Aggravante (4th in last years Milo, the 3 ahead of him were Kenyans) because he financially didn’t have the means to get to Manila to compete. The local government doesn’t seem to give a damn. this story can easily relate to as why we only have 11 athlete’s in London Olympic. because, our government don’t have serious program in discovering well deserve athlete’s like Marcelo who have the passion and determination of a true filipino champion. In behalf of the Baguio- Benguet Running Community, we would like to express our deepest gratitude to Gen, Jovie Narcise for bringing the story our beloved Marcelo “Celo’ Bautista to the Running Community, not just to the Philippines but into the world. The pledges are overwhelming, they are coming from the Running Professionals from Baguio and other parts of the Philippines and all around the world. We can’t thank you enough. Our heartfelt thanks to those who are touched by the story of Celo. All donations for Celo, please get in touch with Gen. Jovie Narcise. Sounds an inspiring story from Marcelo “Celo” Bautista from winning from the ultra marathon races. This could inspire more runners or non-runners that whatever your field in just continue to practice and improve yourself more. nice idol, we are proud of u!!! Marcos-Kennon 50 Miler Road Race by the Philippine Association of Ultrarunners organized by retired Maj.Gen Jovie Narcise was the start of Marcelo’s ultrarunning exposure in the Philppines. Read more about Marcelo’s experience as shared by the Bald Runner.